The new indoor velodrome in Dublin will not only be an invaluable training and racing venue; it can be the start of a new surge across Irish cycling for a whole load of different reasons. And we could even get the Dublin Six Day; just like London, above. Irish cycling has pressed long and hard for a new international standard indoor velodrome. The Government says it’s going to happen and that the money has even been set aside. We believe it will happen; the only unknown is timing. But when we finally get our new track, it can prove a major boost across all of Irish cycling. Success in sport is a funny thing. Finding the right mix of characters in any group in sport can be raise everyone’s game. Similarly, if coaches and athletes don’t gel even the most talented bunch can fall short of their capabilities. Very often it can be about momentum; a breakthrough performance by one rider can show those around him or her what they too can achieve. Anyone who saw the buzz around Mark Downey’s achievements during the World Cup campaign last season, and how others in the buoyant Irish camp also won medals, will understand something of the buzz the new facility can bring. It will be a major psychological and even confidence boost for all of Irish cycling. And as the mood is lifted across the sport anything can happen with the quality road and track riders we have now. Without question, the new velodrome will provide far more training time for our top riders. At present the best riders we have got to places like Newport in Wales and to Mallorca to train on velodromes there. But once we have our own, the training opportunities should be endless. And those riders curious about the track but who have never taken the plunge might be persuaded to give it a go if it’s on their doorsteps, or at least within easy enough reach. Having a track here will simply make this discipline much more accessible. And the number of riders from the road scene, for example, interested in giving it a go should increase. A bigger group of strong riders, all egging each other on, should raise the standard. There’s no doubt a brand new indoor facility will be great for our young riders. It will mean clubs can bring their young members for sessions on the track, and even schools will likely be able to give their kids a go at try-out days. Simply getting a much higher volume of children onto the velodrome should unearth some who will stick at it and flourish in time. We have a velodrome at present of course; the outdoor one on Sundrive Road. But a completely new international standard indoor track will generate for more interest and should see significantly more children trying out. The Dublin Six Day; anyone like the sound of that? 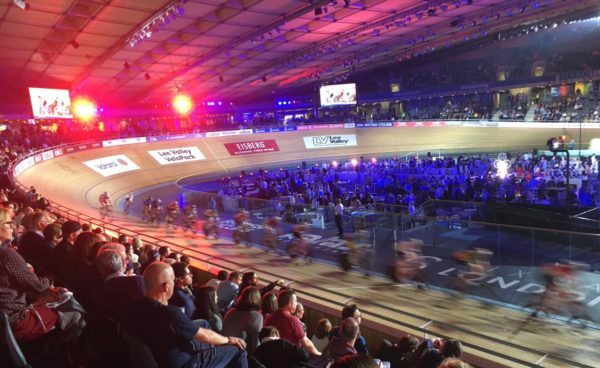 Just imagine Irish cycling fans and those from the UK and other parts of European all pouring into the velodrome for a night of entertainment. Some of the major stars from the UK and further afield would come to race here if they were asked. And Dublin, considering its reputation as such as fun city, would be a welcome addition to the Six Day circuit. In an indoor environment where the weather would not be a concern, RTE might even be persuaded to come and film the National Track Championships for a highlights package. The national broadcaster’s power when it gets behind events is absolutely huge. And it shouldn’t take too much to convince them to come along and film the racing. Putting the bikes aside for a moment; the Irish cycling community has nowhere to gather right now. And that means the cycling community never really gathers as a group. But the new velodrome should put that right. There’ll be plenty of space for events from coaching seminars to trade shows, expos and good old fashioned partying. The venue can become, not just an excellent training and racing facility, but also a club house for Irish cycling.